2017 was an exciting year for Yucatan guacamole and 2018 will be even better! Recently, we’ve opened our new factory, reaffirmed strong partnerships, released exciting new flavors, and more. Now that hard work has finally paid off. The numbers are in. the votes have been tallied. Thanks to our great team and to you, our loyal customers, Yucatan is the #2 guacamole brand in the United State of America! 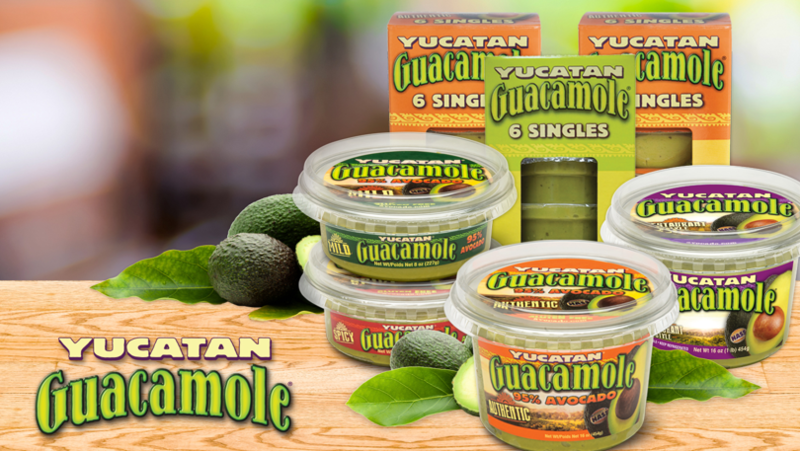 For over 25 years, Yucatan has been committed to providing the best tasting, most authentic guacamole available. There’s a bit of love and history in every tasty bite of Yucatan guac. From the fields of Michoacán in Mexico, where our avocados are grown, we hand select only the finest, golden ripe Haas avocados. Always hand-selected and hand-scooped for that chunky, guacamole taste and texture you love. Our brand new, state of the art production facility opened this past year, ensuring that the taste and quality you’ve come to know and love from Yucatan will continue from here on into the future. Whether it’s our authentic guacamole, mild, spicy, or organic. We’re set to keep producing the varieties you love and deliver them to a store near you. But we haven’t been content with just the same old flavors this year. We also introduced new products and flavors. Our Authentic Guacamole is now available in 100-calories single packs. Perfect for on the go guacamole lovers, school snacks, and more. We also introduced our brand-new Restaurant Style Guacamole. The Restaurant Style Guacamole incorporates a bold, new approach to packaged guacamole products. We retained the delicious texture of the guacamole you love and incorporated a new preparation method. We combined jalapenos, bell peppers, garlic, and more to deliver a cantina-style delight. The new recipe incorporates an element vinegar as well which smooths out the flavors and combines for a fiesta in every container. With 2018, the possibilities are as bold and limitless as our flavors. We plan to continue developing and innovating new products and flavors throughout the year. Who knows, perhaps they’ll wind up in a store near you sooner than you think! We will also continue to work with our partners and our community initiatives to spread the word as well as the love. After all, guacamole always tastes best when shared with your friends and loved ones in the community. Now the #2 guacamole brand in the country, we remain committed to our pledge of delivering the best tasting, most authentic guacamole available. What new flavors and products are on the horizon? Only time will tell. Thank you to everyone who made this possible. From our amazing team to our amazing customers. We wouldn’t be where we are today without your love, support, and patronage. We are excited for what the future holds and hope you will all be along for the ride! Get ready, 2018. It’s Yucatan time!